An expert has revealed how to combat car thieves' latest trick. Electronic engineer Pat O'Leary has responded to shocking footage of a car theft which featured on Independent.ie. He explained how something as simple as a biscuit tin could save your car being whipped from its spot on the drive outside. 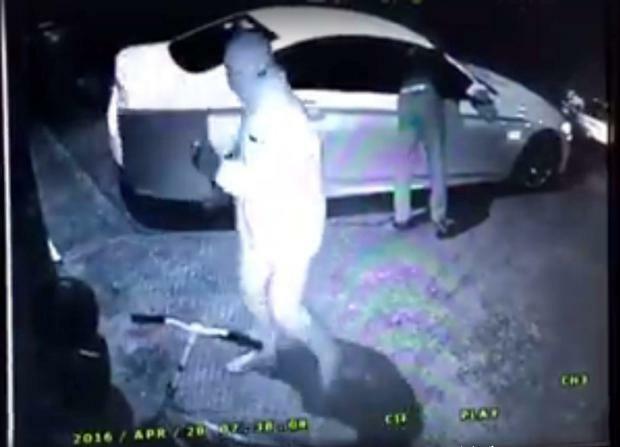 Fitness instructor Jennifer Shannon shared the CCTV footage of her BMW 520 being stolen from the driveway of her home in the Manorfields Estate, Clonee, Dublin 15 in the early hours of the morning last Thursday. The footage shows two men breaking the window of the white vehicle - registration plate 12D41580 - before using what looks like a transmitter and a deflector to gain access to the keyless vehicle. Within three minutes the pair have fled in the car. Mother-of-three Jennifer released the footage to Independent.ie to warn others about ruthless car theft gangs. Speaking to RTE Radio One's Liveline today, Jennifer said she was "absolutely shocked" watching the footage - and the family haven't seen their car since. "The insurance crowd are being good about it," she said. "At the start, they were like 'unfortunately, it's hard to believe', but I said, 'wait until you see the footage'." Now, Wexford-based engineer Pat has advised people to keep their keys or fobs for their vehicles "in something metal" to prevent thieves catching a signal from outside the house. "In a nutshell, there is a password exchanged between the keys and the computer in the car. That password would be unique to your car and your key combination. "Your key is out of range," he explained, "so I'm figuring what they're waving about outside the house is a type of receiving arial. "The signal will be so weak going from the key to the car that it needs a halfway point. "Anyone with half a knowledge of electronics could create something like that. "The simple solution is to keep your key in a biscuit tin box, anything metal. The signal is so weak, it won't take a lot to kill it." The trio on air came to the conclusion that the car was most likely stolen for parts as the thieves would be unable to restart the car without the connection again. Speaking to Independent.ie last week, Jennifer said she wants to warn others so they don't find themselves in the same situation. "It's scary that this could happen so fast. I would warn others to be very aware. We thought we were doing everything right by getting an alarm, leaving the key upstairs and putting in CCTV," she said.